Looking for spacious, single-level living with room to expand? 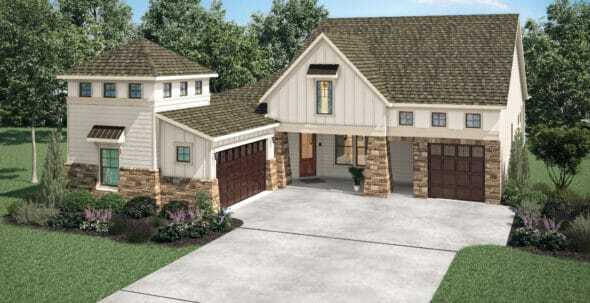 Look at The Rutherford, an elegant home in The Vineyard. The distinctive exterior in shades of white suggests an innovative interior. The home features diverse living spaces—from a covered courtyard and traditional dining room to a covered outdoor living area overlooking the backyard. The expansive great room and kitchen with optional double island are the warm heart of this home. A clever “appliance kitchen” keeps the stand mixer and slow cooker out of sight, but easily within reach. The owner’s suite and second bedroom are roomy and relaxed. From the golf cart garage head upstairs to an unfinished storage space. If that’s not enough storage space, head upstairs from the laundry to an additional space for a studio or gym. And, this house comes with a charming private casita (“mini house”) to accommodate family members and guests. The Rutherford? It’s all you want it to be, and more.